Wolfgang Schneiderhan (violin), Bamberger Symphoniker, cond: Ferdinand Leitner (Bruch) resp. Fritz Lehmann (Tchaikovsky)., stitched / sewn polylined gatefold cover dated 8/53. Im Anschluss wird Ihnen der „Warenkorb" angezeigt. VIVALDI- L'ESTRO ARMONICO- 12 CONCERTI, OP. 3. THE DOUBLE VINYL LP IS IN VERY GOOD CONDITION, NO SCRATCHES, NO MARKS OR SCUFFS. JACKET AND LINER NOTES ARE IN GOOD CONDITION. ORIGINAL JACKET, ORIGINAL PAPER DUST SLEEVE. Wilhelm Kempff (piano), Berliner Philharmoniker, cond: Ferdinand Leitner., cover with red stereo logo dated 7/62. (5) Kauf über die Funktion "Preisvorschlag". Dabei bestimmt er einen Start- bzw. (1) Gegenstand des Vertrages ist der Verkauf von Waren. TATYANA NIKOLAEVA piano. T. NIKOLAEVA (piano). TCHAIKOVSKY: Concerto №2. 2nd CONCERT for piano with orchestra. 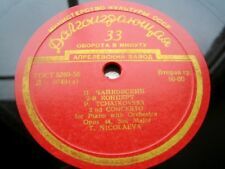 VERY RARE Russian LP D-0749. FANTASTIC EXTREMALE RARE EXPORT RUSSIAN PRESS. 1-ST press RED LABLE GLOSSY DOLGOIGRAYUSHCHAYA, USSR. CHARLES DUTOIT - conductor - London Philharmonic Orchestra. nice DGG STEREO LP ED1 from Germany. DGG first Edition. - Concerto for Violin and Orchestra No.3 in E major -. - Sonata per la gran Viola -. I MUSICI, PINA CARMIRELLU, VIOLIN. 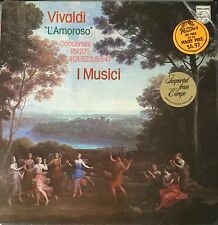 VIVALDI- L'AMOROSO- CONCERTOS RV 271, 401, 523, 547. THE VINYL LP IS IN VERY GOOD CONDITION, NO SCRATCHES, NO MARKS OR SCUFFS. JACKET AND LINER NOTES ARE IN GOOD CONDITION. KARL RICHTER Ensemble BACH Harpsichord Concerto BWV 1052 ED1 DECCA MONO LW 10"
HI-FI LW 50110. DECCA HI-FI MONO. 500grams parcel. Visual Grading under a 100 Watt light bulb . (typically works for a double LP, plus editional seperate Lp, and or Box Sets of 3LP, mostly also for 4LP(without heavy Box or inserts). ). EARLY LP PRESSING. . IMPORT. . MADE IN SOUTH AFRICA. . COVER IS IN EXCELLENT CONDITION. . HAS A TEAR ON THE BOTTOM SEAM AND LIP. . VINYL IS IN NEAR MINT MINUS/NEAR MINT CONDITION! Christian Ferras, violin. Violin Concerto in D, Op.61. 139 021 (R 105 156). LEONIDAS KAVAKOS THE 4 SEASONS VIVALDI ORIG GREEK LP SOLO VIOLIN RARE!!! [LEONIDAS KAVAKOS on violin, the THESSALONIKI CHAMBER ORCHESTRA conducted by KOSMAS GALILEAS! ANTONIO VIVALDI ~. GREEK ORIGINAL PRESSING STEREO LP ]. In the next few weeks I will list lots of vinyls. The LONDON record number is:# OSA 1169 ffrr. ¸ The Secret Of Susanna ¸. The 1 record is in VG to Near Mint condition. a wonderful play! The Box Set cover is in excellent condition with libretto included. very nice! Sir Georg Solti, conducting. Imported Audiophile Pressing. Symphony No. 4 "Romantic". The Chicago Symphony Orchestra. London Records #LDR 71038 (Import). A Beautiful Fully Sealed Album. The sealed vinyl record is in excellent condition. YURI BOUKOFF, PIANIST. CONCERT COLONNE DUCRETET THOMSON CC507. PIERRE DERVAUX CONDUCTING ORCHESTRE DE L'ASSOCIATION DES CONCERTS COLONNE. BEETHOVEN: PIANO CONCERTO NO.5 (EMPEROR). PAPER INNER SLEEVE. EARLY LP PRESSING. . IMPORT. . MADE IN THE UNITED KINGDOM. . RED/SILVER. . GATE FOLD COVER IS IN EXCELLENT CONDITION. . VINYL IS IN NEAR MINT CONDITION! ARTHUR GRUMIAUX - Violin solist BRUCH - Violin Concerto No.1 in G minor, op.26 - Bernhard Haitink - conductor. BRAHMS - Violin Concerto in D major, op.77 - Eduard van Beinum - conductor. Made in Holland. EVGENY MOGILEVSKY - Piano Solist - performs Kondrashin - Moscow State Philharmonic Orchestra -. RACHMANINOV - Piano Concerto No. 3 in D minor, Op. 30 -. HI-FI STEREO VINYL LP - heavy Vinyl - OPERA LABEL STEREO 1ED # 73625 -. This EMI/Angel release #AE-34408 also features the Cleveland Orchestra. Vinyl is glossy and scratch-free. Sleeve is in excellent condition with minimal wear and a previous owner's initials. 1962 Archive Production The Italian Settecento ARC 3218. Research Period, Series A: The Concerto. B2a Allegro 5:31. Lute – Karl ScheitViola d'Amore – Emil Seiler. B1c Allegro 4:18. B1b Larghetto 4:34. Beethoven - Violin Concerto in D Major op. 61 (Eterna 826220, stereo, GDR 1972). Josef Suk (violin) &Czech Philharmonic Orchestra, cond. : Franz Konwitschny. Condition cover: EX . Condition record: EX . ROBERT AND CLARA SCHUMANN- THE COMPLETE PIANO TRIOS. BEAUX ARTS TRIO. JACKET AND LINER NOTES ARE IN GOOD CONDITION. The DEUTCHE GRAMMOPHON record number is:#2721067 w/ Libretto. CLAUDIO ABBADO. 4 SYMPHONIES. MADE in RUSSIA / USSR. I bought this album in the USSR in the 1980s. no shrink wrapped. for Sale: VERY RARE VINYL LP in MINT UNPLAYED condition. RECORD: MINT - UNPLAYED. I MUSICI, HEINZ HOLLIGER, OBOE. VIVALDI- 5 CONCERTI PER OBOE R. 448, 449, 456, 543, 548. THE VINYL LP IS IN VERY GOOD CONDITION, NO SCRATCHES, NO MARKS OR SCUFFS. JACKET AND LINER NOTES ARE IN GOOD CONDITION. Cover is in very nice condition - in original shrink. Record is in VERY nice condition, no visual defects - would grade EX Plus ( using Goldmine grading standards ). VERDI- IL CORSARO. JACKET AND LINER NOTES ARE IN GOOD CONDITION. ORIGINAL JACKET, ORIGINAL PAPER DUST SLEEVE. VIVALDI- 6 DOUBLE CONCERTOS. THE VINYL LP IS IN VERY GOOD CONDITION, NO SCRATCHES, NO MARKS OR SCUFFS. JACKET AND LINER NOTES ARE IN GOOD CONDITION. VERY COLLECTIBLE. A MUST HAVE FOR ANY COLLECTOR. Classical Music, Opera 1713, Vinyl LP. Record: ex. Sleeve: ex-. original German pressing,rare item . BIZET- SYMPHONY IN C- JEUX D'ENFANTS. THE VINYL LP IS IN VERY GOOD CONDITION, NO SCRATCHES, NO MARKS OR SCUFFS. JACKET AND LINER NOTES ARE IN GOOD CONDITION. Christian Zacharias (piano), Staatskapelle Dresden, cond. : David Zinman. Mozart - Piano Concertos in E Flat Major K. 482 & in A Major K. 488 (Eterna 725047, digital recording, GDR 1987). Condition cover: EX . BERNARD HAITINK conducts the. ALFRED BRENDEL piano. BEETHOVEN Piano Concerto NO.4. London Philharmonic Orchestra. 1 LP or 12” record. 2 LP’S or 12” records (Gatefold records count as 2 pieces). 3 LP’s or 12” records. BOOKLET EX. REST OF THE WORLD. WE GRADE VISUALLY USING GOLDMINE GRADING GUIDE. LIST IN SPANISH IN COVER AND LABELS. Very rare CORAL STEREOPHONIC ED1 audiophile pendant Pressing - Germany 1960s made -. RUGGIERO RICCI - VIOLIN. CORAL STEREOPHONIC first EDITION. SAINT-SAENS - Concerto for Violin and Orchestra No.1 in A major, op.20 -. FIRST PRESS LP. CONDITION_ FIRST PRESS. FRENCH GERMAN ITALIAN LATIN VERSION. The DEUTCHE GRAMMOPHON record number is:#2864004 stereo w/ Libretto. Rafael Kubelik conducting the. COMPLETE SLAVIC DANCES. ¸ DVORAK ¸. Imported Audiophile Pressing. Symphony No. 1. The Chicago Symphony Orchestra. London Records #411 731-1 (Import). A Beautiful Fully Sealed Album. The sealed vinyl record is in excellent condition. I MUSICI, SEVERINO GAZZELLONI, FLUTE. VIVALDI- FLUTE CONCERTOS P. 140, 203, 80, 205, 342. THE VINYL LP IS IN VERY GOOD CONDITION, NO SCRATCHES, NO MARKS OR SCUFFS. JACKET AND LINER NOTES ARE IN GOOD CONDITION.